Easy ASP Hosting Review 2019: Is Easy ASP Hosting a Good Hosting? 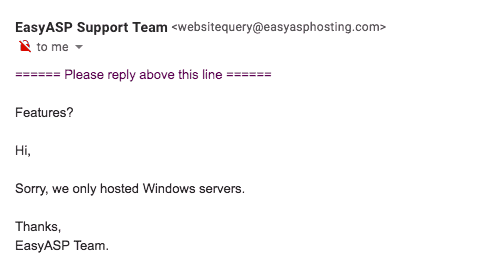 As its name suggests, U.S.-based hosting provider Easy ASP Hosting specializes in Windows ASP hosting. While it doesn’t use SSDs and doesn’t offer an uptime guarantee, it does own its own data center. 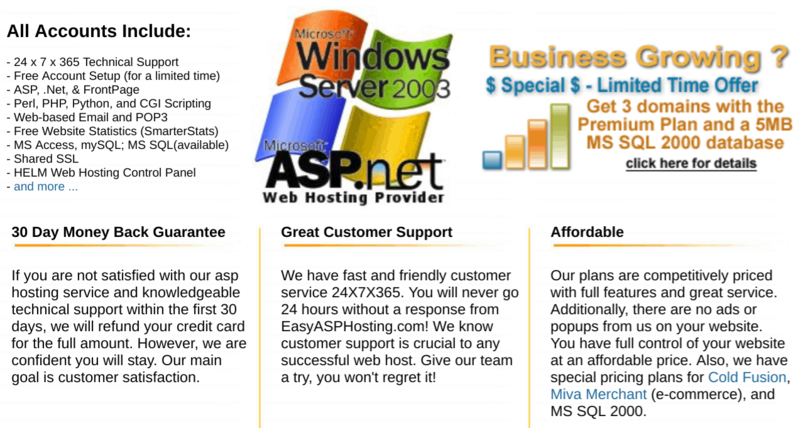 Easy ASP Hosting has been providing Windows hosting since 1997. It owns its own 5,000 square foot data center, which is located outside of Denver, U.S., and it provides ASP hosting services to customers all around the world. Its website is available in English. Easy ASP Hosting owns and operates its own 5,000 square foot data center, which is good news, as it generally means quicker responses to technical issues. Built in 2003, this $10 million center is monitored 24/7 by on-site staff. It’s so much more surprising, then, that this company – which boasts “exceptional uptime and reliability” – doesn’t offer an uptime guarantee. As the name suggests, Easy ASP Hosting sells only Windows ASP (and ASP.NET) hosting plans. However, these plans do include some tools and technologies – such as MySQL databases and Perl/Python programming languages – that you might also associate with Linux hosting. Of course, you get Microsoft tools and technologies including Microsoft Access databases, but SQL Server databases are listed as optional. The Microsoft technologies detailed on this vendor’s “old school” website (especially Access and FrontPage) have a distinctly ‘retro’ feel, which made me wonder whether it was still operational at all. Somewhat surprisingly, yes it is! Easy ASP Hosting’s plans are not easy on your wallet, but this is a specialist Windows hosting firm with its own data center, therefore not a simple reseller of Linux hosting plans. Plans can be purchased on six to twenty-four-month terms, with a deep discount for committing to a two-year term. Your commitment risk is mitigated slightly by the 30-day money-back guarantee that gives you a little time to see if you’re happy with your hosting. The online support ticket system is complemented by a set of interactive Flash tutorials and a searchable FAQ database that together should help you to help yourself. Easy ASP Hosting is a long-standing (some might say “stuck in the past”) Windows hosting provider with its own data center. If you’re looking for specifically for ASP(.NET) hosting, then you might want to look here, but there are less expensive and more modern hosting providers if you’re happy to go down the Linux route instead. Wondering how Easy ASP Hosting stacks up against other Web Hosting companies? Enter any other Web Hosting company and we will give you a side-by-side comparison.